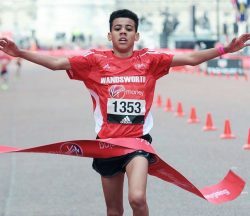 The Wandsworth under 13s boys team won the Virgin Money Giving Mini London Marathon on Sunday (April 23). 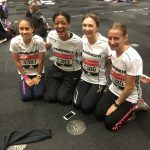 The event, held on the same day as the main London Marathon, is the official British Athletics three-mile road championships for young athletes aged between 11 and 17 and is run on a three mile course from Old Billingsgate to The Mall. Previous winners include double London 2012 Olympic gold medallist Mo Farah. 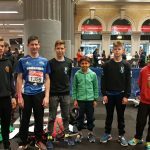 Thirty-six young athletes from Wandsworth competed again the best new talent in British road running from all over the UK, including teams from all 33 London Boroughs. Six groups represented Wandsworth; under 17, under 15 and under 13 (male and female) with outstanding results across the board. Jaden Kennedy won the under 13 race in a time of 15 minutes 57 seconds. Wandsworth were in the top five London boroughs in five of the six categories. The Wandsworth athletes were selected from running trials which took place in Battersea Park in February. Wandsworth’s sport development team works with sportspeople, clubs, community groups and coaches to help develop sport and physical activity in the borough. 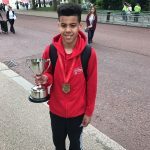 Clubs can gain support, development and funding advice and young athletes are supported and trained to represent the borough in the Wandsworth Youth Games. 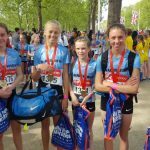 Enable Leisure & Culture provides sports services on behalf of Wandsworth Council, including sports development, sports centres, school sport competitions and the annual Get Active Wandsworth Festival. Find out more about sports in the borough at www.enablelc.org/els.